I don’t know where these originated but I can relate to every one. See you when I get back from the time machine. Have a great day! Author’s note: Maxine is copyrighted by Hallmark and Calvin and Hobbes by Bill Watterson. 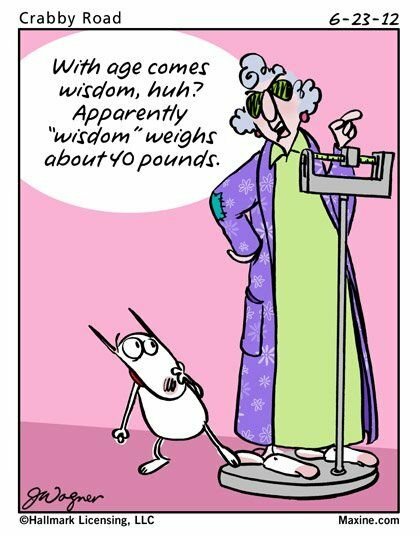 This entry was posted in Aging Gracefully, Humor and tagged cartoons, Maxine, Old age, old age jokes by Kate Crimmins. Bookmark the permalink. Never enough smiles and giggles – why do people have to either be or so young no one pays attention to you or older to realize that? Pouring here but much warmer. Have to thaw out the humor once in a while. That “secrets are safe” point is so true. I went to tell a bit of gossip from the past to someone in the present– got started then couldn’t remember for sure who it was that I was gossiping about. Some things get a little fuzzy. My husband was telling me about an experience we had together. I didn’t recognize it (as he told it anyway) so I asked if I was there and if I had a good time. Yes to all 5! Debra’s comment about her MIL stating “Getting old takes courage.” … so agree with that more than the “getting old isn’t for sissies” which I use often. But the older I get, I think it takes courage… 🙂 Enjoy your visitors! It takes a lot of courage and fortitude! It does! I think it really kinda hit me this morning with your fun facts… 🙂 It’s an ongoing maintenance plan. It is. When I was younger I thought the problems were mostly cosmetic (wrinkles, graying hair) but those are the easy parts. No one told me about losing energy and interest and body part relocations. Let’s not forget the new ache or pain that my hypochondria takes to the highest level. Or the face that some friends are actually dying and not from auto accidents. I have to admit I still find speed limits a challenge. I’m pretty good, though, at watching for the cops. Have fun with your house guests. Oh, dear! I wouldn’t want to put it that way. Let’s just say that some speed limits around town are unreasonably low. Ha ha. There are some that may be “suggestions.” There is a main road that goes through our development. No one uses it but residents and people going to the neighborhood park. They lowered the speed to 25 mph about a year ago. My car doesn’t go that slow. Being president of our homeowners’ assn., I had to sign off on a reminder that we have a sign posting a 15 mph speed limit. There were some complaints. Hmm. Thank you for the evening giggle. There’s much truth behind that humour! Aging requires laughter to survive it. Maxine always makes me smile! I can remember when my mother-in-law would say to me, “Getting old takes courage.” I was probably 35! LOL! What did I know then? Nothing. Now I fully understand what she was trying to tell me. I think it was a warning to pay attention and prepare for what was coming. However, you can’t know until you arrive! Enjoy your houseguests! I always get a smile when some 40 something complains about getting old. They haven’t seen anything yet! Your MIL was smart. Maxine and Calvin and Hobbes are always good for a smile as are aging jokes, especially as I am now in that category joked about. Hmm. It sneaks up on you doesn’t it? Haha. Not sad – you’re lovely just as …. YOU! Yes, we’ll go with that. Calvin and Hobbes was one of my favorite comics. And then I had a little boy and read them again. They were truer and funnier. I expect they were. I had granddaughters. Nothing like my nephews. I love Calvin and Hobbs! I think I’d be more likely to go back in time in my time machine… there are a few – though not many – things I’d change. Just a few! I think we all do. I can relate to every one of them! Hope there are snacks in the machine! At the minimum, good coffee. Calvin & Hobbes was the correct answer on Final Jeopardy last night! The category is Comic Strip Title Characters. I may not be 50 yet but my body is very accurate with forecasting the weather! My hands and knees are good weather indicators…………. and that’s not because I’m crawling on them! My body can tell me more than the forecasters. My cats too. My joints have always been more accurate that the local weather person. One thing I could add that comes with age is I don’t waste time trying to figure out other people.